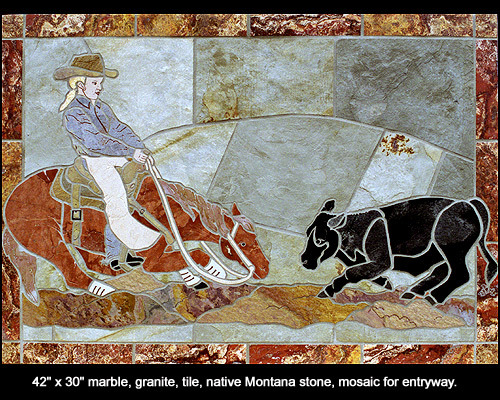 Photo gallery of mosaics done on floors and entryways by Jim and Holly Cutting. The images below are all flooring and entryways. Step onto something fun and unique inlaid inside your front door or bear tracks into your pantry like one of our customers did or wolf/dog tracks leading out to the dog door across the basement floor. There is endless ideas and we are happy to help you come up with something fun and personally for you. We can ship our mosaics in loose (puzzle) pieces or often thinset them on backerboard so that our customers can finish the installation themselves. We are always here to help with questions or concerns about your project. Check our other mosaic galleries. Mosaic gallery ( 1 ) has many photos of wall installations. Our third gallery ( 3 ) has a variety of mosaics used in many different types of applications.